Several months ago, I read a great “dog” book called Seven Days to Goodbye. The idea of a service dog is prominent in the book, and I have heard plenty of people praise the power of service animals. Today I have the opportunity to feature a guest post by author Sheri S. Levy, who wrote the book. When I contacted her, I specifically wanted to know: what inspired you to write the novel, especially as it relates to service dogs. Enjoy her post below, and then check out more information about the book at the bottom of the page. It’s clear from all of the pictures that we have a dog lover in our presence! Years ago, after acquiring my special education teaching credentials, I put teaching on hold and opted to stay home with our young children and babysit for a neighbor. Her young daughter, two years old, and the same age as my daughter, gave me the chance to play school. Our son attended half-day kindergarten and before long three additional school age children joined us after school. Seven-year-old, David, lived across the street with a single, working mom, and his beautiful German Shepherd, Charlie. They wandered over every day and Charlie attached herself to my husband, Murphy, as he worked outside. When David and his mother couldn’t keep Charlie, Murphy instantly offered to take her. 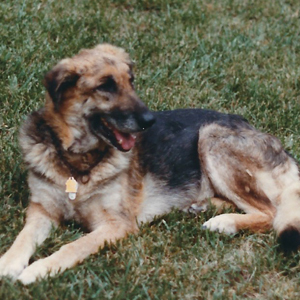 She was our first dog and the reason for all of the following dogs. After Charlie’s death, Murphy cried in his pillow. When he traveled out of town, the children and I found the perfect puppy for his birthday. 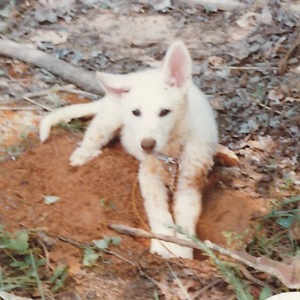 An eight-week-old, white German Shepherd, Gretchel, our family pet for twelve amusing years. With our children gone, it pained us to say goodbye to our first grown puppy. We tried to hide our need of another dog. But it wasn’t working. A friend introduced us to her Australian Shepherds, and an unbearable desire for a pup escalated. 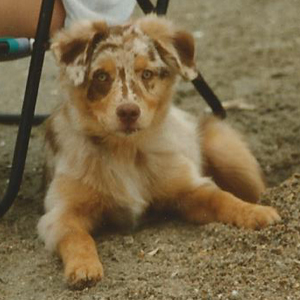 We drove five hours to the coast to claim our first red-merle. 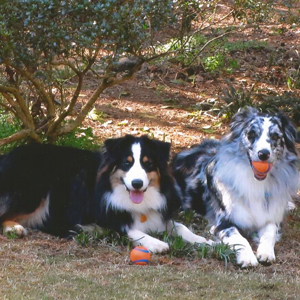 Sydney became our first house dog, slept in our bed, joined us at Edisto, and repaired our hearts. At six months old, Sydney romped in the snow during a January snow storm with a black Lab pup. Thinking it was a neighbor’s puppy, we played and sledded for hours. Frozen to the bone, we headed home and the Lab followed. I called the neighbors. No one knew of a black Lab missing. We waited two days for the snow to melt, and then took him to the vet. She examined him, found he had three puncture wounds, and told us he was around Sydney’s age. We named him Jake and our two-dog adventure began. As both dogs aged, we retired and traveled across the US for a month in our old Tahoe car. The dogs walked the streets with us and rested in the hotel while we dined in the evening. A couple years later, after repeating this trip, Sydney became ill and we had to say goodbye. I wasn’t sure my heart could take the pain. An idea about creating a story with a special needs child, and Sydney and Jake, festered in my mind. I wrote for years, revising and editing until a critiquer mentioned removing Jake to reach my emotional theme. Dreading deleting Jake, I shared this idea with Murphy. He reminded me I’d always have Jake with me in spirit. We toasted Jake, and I deleted him from the story. My funny, happy, and sad experiences with dogs and special needs children shape my stories. Writing the real and the make-believe pieces of my life is cathartic and spurs my imagination. 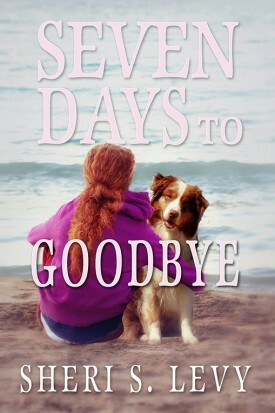 Seven Days to Goodbye is my heart book and its saga will continue. After Trina’s beloved dog dies, she swears she’ll never get another one. But then she learns about service dogs, and realizes if she becomes a puppy raiser, she could train puppy after puppy and never worry about them dying. But like all great ideas, this one has a serious flaw: her first service puppy must be returned to his kennel at the end of their week-long summer vacation. And saying goodbye to Sydney is going to be much tougher than she ever imagined. Trina’s last week with Sydney is made that much harder by her newly strained friendship with her best friend, Sarah, who’s become so over-the-top boy crazy that she’s almost like a stranger. Sarah is determined to have them hang out with every boy at the beach, but when a boy named Chase takes an interest in Sydney and Trina, it puts an even bigger strain on the friendship. 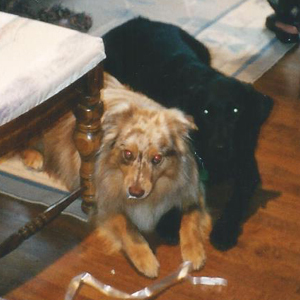 It’s hard enough to deal with losing Sydney, but now she may lose her best friend, too. And even if she manages to patch things up with Sarah—and figures out what to do about Chase—she still must face a daunting decision: is she strong enough to take on another service puppy? You can read a free preview and get a 35% off coupon here. Posted on August 3, 2015, in character, inspiration, service dog. Bookmark the permalink. Leave a comment.